My Quilt Infatuation: Needle and Thread Thursday, and a Dash of Luck! Don't you just love looking at a sharply cut stack of fabric? I know I do! I have a date with my sewing machine this evening to start making some progress on these! Now, take a look at some of the fabulous projects that caught my eye last week! Lorna at Sew Fresh Quilts shared this simple, but pretty quilt. Quick and pretty is right up my alley! 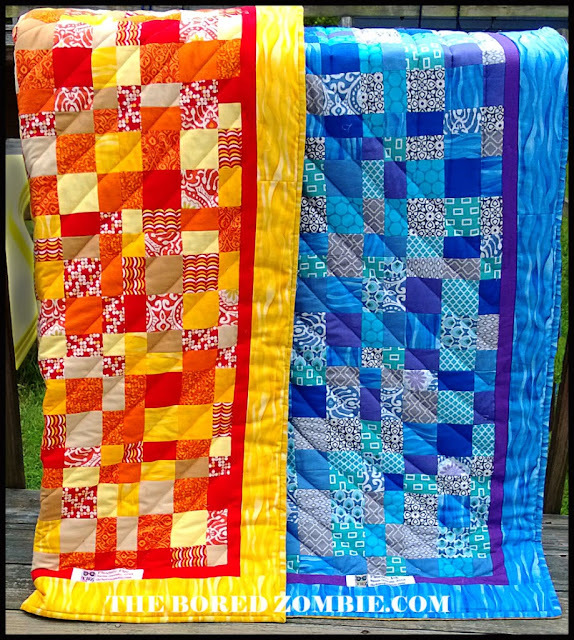 Susan at The Bored Zombie shared this really cool two-sided quilt! Even the binding is two sided- you should hop over and take a look. and Jess at Quilty Habit shared this stunning Dresden Rainbow quilt. The story Jess shared with this quilt is wonderful, and her post is full of close-ups of each Dresden. I am truly inspired by you each and every week and look forward to seeing what you're up to, so without further ado- let's party! Oh, hst's how i hate them, but at the same time love them! Churn dash has forever been on my list, can't wait to see yours come together! I like cheesy. It's one of my specialties! Ha, ha! Loving that stack of fresh Happy Go Lucky, Kelly! And, of course, the roses in the background. Thanks for hosting such a wonderful linky party. It is a treat to see what everyone is up to each week! Your new project looks really exciting!! Love your stacks of fabric! Ooo, that stack looks so delicious! Can't wait. Yes! I love piles of fabric too. :) I thought I was weird. Thanks a million for showing off my Phoenix quilt! I'm so glad you like it and I really appreciate the share! I'm so glad you're finally digging into your Happy Go Lucky stash! Can't wait to see it! Lovely stacks of fabric. Can't wait to see it put together. I love the churn dash block and it will be wonderful in that fabric. Nice job on the photos too! I am thinking I am going to do them in Simply Style. Loving that line right now. I will do a new quilt with churndashes as soon as possible. I think they are so nice to do and I like to "play" with the fabric. Your friends fabrics looks great! Wow Kelly, did you chop all that? Excellent work and lovely photographs! that is quite a stack! have a fun date with it. =) I love the name, btw. you'd better use it for the quilt, not just the post. I thought at first Susan's double sided quilt was that stack all finished and figured you'd done it super speedy again! Thanks for hosting Kelly - yes, that is a gorgeous stack of freshly cut fabric. That second photo is amazing, Kelly! Wow. Love it. Hope you get your sewing-machine time with this pile very soon! Love that stack of cut fabrics!! your fabric should be showcased very nicely with a churn dash and I can't wait to see it. You need to do a cutting tutorial. That stack is just beautiful. Such a pretty stack of fabrics all ready to sew. I really like the quilt blocks framed in lime green.Thanks for including those three links!